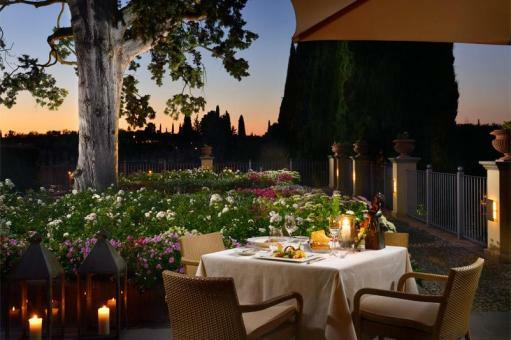 Located in the former stables of Castello del Nero, our one Michelin Star La Torre Restaurant, one of the best restaurants of the entire Tuscany, showcases a meticulously researched menu, designed to deliver the best of Italian and Tuscan Traditions. This is thanks to the fresh and genuine ingredients bought from local farmers, or from the herbs taken directly from the Castello’s organic garden, carefully tended by Chef himself. The innovative a la carte menu offers a large range of dishes elaborated by the Executive Chef Giovanni Luca Di Pirro and based on the Tuscany flavours, and created by using these fresh local products. The central feature of the elegant dining room is the exquisitely decorated fireplace which complements the high arched ceilings and terracotta tiled floors. This Michelin star restaurant in Tuscany boasts spectacular views through its large French windows which overlook the panoramic terrace and the breathtaking landscape of the Castello del Nero estate, which produces its own red wine and extra virgin olive oil available in the restaurant and for sale. During summer, service at La Torre Restaurant moves to the Garden Terrace on which guests can dine al fresco and enjoy a magnificent view over the Tuscan hills. These charming venues are open in good weather for buffet breakfast, which features a wide range of fruits, cereals, cheeses and homemade breads and pastries, as well as à la carte cooked items.